"Once our eyes are opened, we can't pretend we don't know what to do. We are back online! It has been quite the whirlwind these last couple of years for Bowen. He has been on a few different news programs so I thought I would share them here. Here is the first... the one that started it all back in September of 2014. Our local news did a wonderful story on Bowen and his adoption. It still brings tears to my eyes when I watch it. Maggie O'Mara did a wonderful job capturing the joy of Bowen and our life together as a family. Finally some video of Bowen swimming all on his own! He no longer needs my help, he swims completely independently. In this video, he is looking at the numbers (he LOVES numbers!) on the side of the pool when he flips over on his belly and is looking around. He swam with his brothers for over an hour in the pool today! This is how he gets to where he wants to go! Pretty cool! Sledding day at the local ski hill! Bowen had a great time... he loved racing down the hill & being pulled back up! Brooks & Bowen heading up the hill. They were having such a good time! Daddy & Heath doing the hard work. Brooksie loved lunch & hot chocolate at the lodge! I just love my boys so much! Heath heading out for his first night of basketball. Our gym holds a parents night out. Heath usually goes alone but for the first time, Brooks got to go too. They were both so excited that they got to go together. So sweet & cute! We adopted a new dog from the Humane Society right after Christmas. She is a toy poodle mix and is such a wonderfully sweet dog! She is Heath's dog but really she is our family dog just like the others! She is so great with the boys. She is so patient and loving and lets them play all sorts of games with her. When they get home from school she runs and jumps on them. Such a wonderful addition to our family! We were working on our house to get it ready to put on the market so that is the reason for the clutter in the background but who notices clutter when this cute boy is standing there in his helper legs!!! Working hard at PT! This day, a woman (I forgot to ask if I could share her name) who is a bilateral amputee came to Advanced Prosthetics just to meet Bowen and encourage him! What a blessing that was, especially for me. It was so great seeing a double leg amputee getting around so well! She does 45 minutes on the treadmill every day! If you did not know she had prosthetics, you would never be able to tell just by seeing her out and about. I have met a lot of single amputees who are missing just one of their lower limbs but to meet someone in person who is successfully getting around while being a double amputee... that was a first and I am so grateful she had the heart to come and meet us! Advanced Prosthetics has a turtle named Ivana Walk (cute) and Brooks' new job is feeding the turtle each time we are there for Bowen's appointments. He loves this job and takes it very seriously! He just loves that little turtle. Bowen having an in depth discussion with his PT, Miss Lindsey. I am sure it went something like this... "I done with helper legs. All done. Candy please." Yep, that sounds about right! such a handsome little boy patiently waiting. All bundled up for the cold standing by the door, ready to head out. 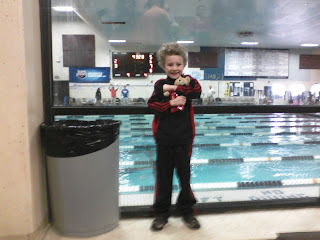 Swim meet time for Heath! 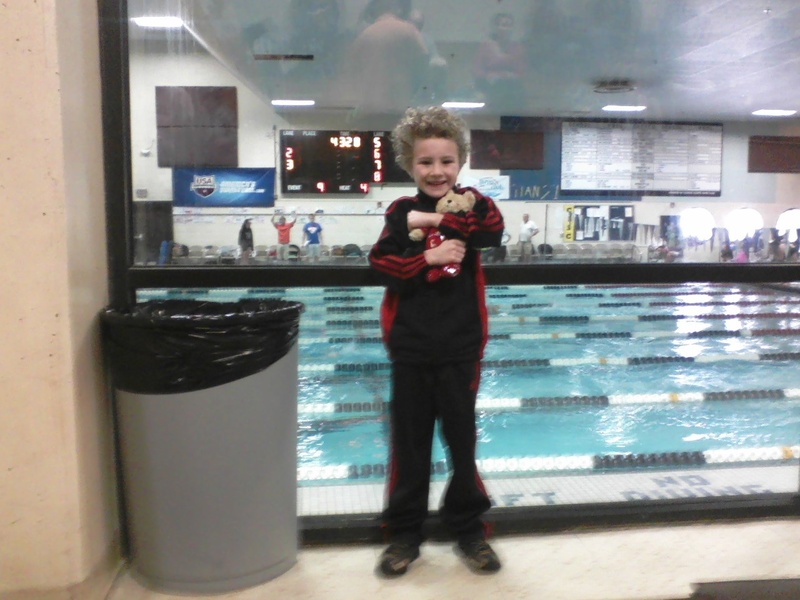 He improved his 50 M backstroke time by 15 seconds! Way to go Heath! So that is what we have been up to the last couple months. Blessings! Bowen has been working so hard at PT these last few months and today he accomplished something very big. Today, he walked on his own!!! Well, I should say he walked without any assistance by us. He used a walker and everything you see in this video link... he did all on his own! We are SO proud of him. Bowen's new helper legs... thanks to Advanced Prosthetics. He LOVES the fact that he can wear dinosaur light up shoes like his brothers now! This link provided below to another article from another blogger titled Please Don't Help My Kids is exactly how I feel with Bowen. We are raising Bowen just as we are raising our other boys, we are not setting preconceived limitations on him because he has limb differences. We truly believe he can do anything any other child can do, just in his own way! So often people want to coddle him and help him with even the smallest of things. That does not help him at all. He needs to learn how to be independent. He needs to learn that sometimes, we may not accomplish something on our first try but to get up and keep trying until we do. He needs to learn that even though he has limb differences, he is just like everyone else! Bowen is very good at trying to manipulate people into thinking he can't do things, so they will do it for him. A lot of that is probably learned behavior from his first 18 months of life spent in an orphanage. So he needs to be pushed to do things. He needs to hear that he can. He needs to learn to try even when he doesn't want to. And you should see his face light up with joy when he does something that just seconds before he was telling us he couldn't do! It is priceless! There is no "I can't" in our house. When we hear this, we simply say "Yes you can." And he can... just give him a chance! I have to say, that Jeremy and I were completely disgusted and shocked by something we saw at Monster Jam this weekend put on by Advance Auto Parts. We are not monster truck fans but thought we would take the boys since they are at an age where things like monster trucks seem pretty cool to them. The monster truck part of the show was fine but what Advance Auto Parts decided to do during the intermission times was unbelievably shocking. They had the master of ceremonies bring out a gentleman with dwarfism and proceeded to mock him as a form of "entertainment". Why in the world anyone would think the MAKING FUN OF SOMEBODY'S DIFFERENCES is an acceptable form of "entertainment" is beyond me. They didn't just bring him out once, twice... no, it was about 5 times (about 5 to 10 minutes each time) and each time the MC made fun of the way this gentleman looked, walked, ran, moved his arms... the list could go on and on. Why is something like this going on in this day and age?! It made me wonder what all those kids that were staring at our son with limb differences as we were leaving were thinking. If they are being exposed to this kind of "entertainment" where it seems perfectly acceptable to make fun of somebody's differences why in the world would they have any compassion for our son or others with differences. The whole thing just really saddened, angered and shocked us. I am a blessed mother of three sons who is married to a wonderful man that adores his children. Currently, I am a stay-at-home mom and I feel so fortunate that I am able to spend these next few years at home with my sons. They bring so much joy and love into my life every day and I couldn't be happier! We also have two wonderful dogs who give us an enormous amount of unconditional love and one who constantly keeps us on our toes. I am grateful every day for my life, my family and the journey we our on.